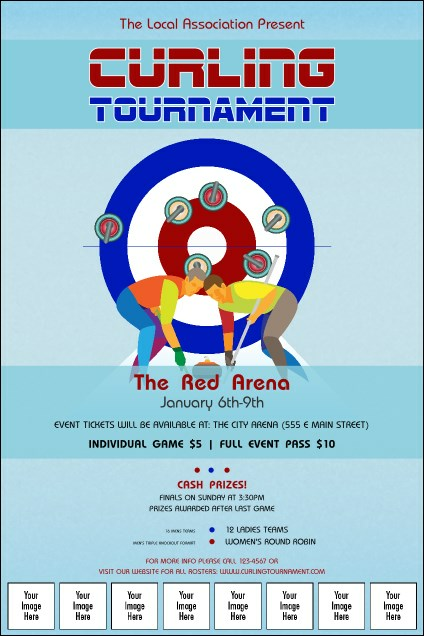 Make sure your marketing is on the broom with the Curling Tournament Image Poster! Reflecting the energy and fun of a bonspiel via bright colors and eye-catching graphics, this template is a great way to capture attention. In addition to offering plenty of space for competition information, it has eight custom image upload spots. Poster size is 11.46" x 17.18”, approx. Set yourself up with keen ice! Use TicketPrinting.com posters to promote your event.